MUSIC PROMPTS US TO RESPOND WITH OPEN-HEARTEDNESS INSTEAD OF JUDGMENT. IT USHERS US TO A HIGHER PLACE FROM WHERE WE CAN SEE BEYOND DISTRACTIONS TO WHAT IS TRUE AND GOOD AND LASTING. IF MUSICIANS ACCEPT THIS RESPONSIBILITY, THEY CAN CHANGE THE WORLD. Such a view is not surprising from someone who has spent a lifetime with open-hearted music. When guests enter first part of the Main Gallery in the museum at Bethel Woods Center for the Arts they are surrounded by some of the 400,000 people who sat on the field at that historic event. Above guests is a movie showing with commentary pieces of the festival. While Michael Shrieve does his iconic drum solo with Santana, Country Joe McDonald exclaims, “17!” referring to Shrieve’s age. 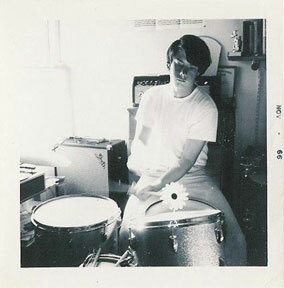 On Saturday 16 August 1969, Michael Shrieve was young, but not that young. Shrieve was born on July 6, 1949. He had just turned 20. We can forgive McDonald. By early Saturday, it was already a long weekend. Wrong twice as Sha Na Na’s Henry Gross, born on April 4, 1951 and 18 that August was likely the youngest performer. And CSN & Y’s bassist Greg Reeves may actually have been younger. Ah well. Such is the Woodstock Haze. 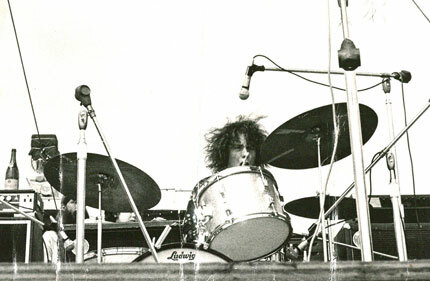 During a performance at the Fillmore Auditorium, Shrieve came to the attention of Santana’s manager. A short time later Shrieve joined the band and became a mainstay. His jazz background helped develop a sound already influenced by the band Latin percussion component. 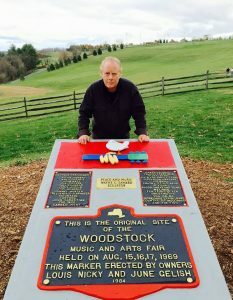 The aforementioned drum solo at Woodstock, it’s inclusion on the album as well as the movie put Michael Shrieve forever into the 1960s’ musical picture. Shrieve remained with the Santana band until 1974 and has continued to be active since. He has released several of his own albums and collaborated with or sat in with dozens of other albums. He occasionally rejoined the Santana band which continued to undergo various personnel changes throughout the years. In 1998, the he was inducted into the Rock and Roll Hall of Fame.